Many of us have read a Choose Your Own Adventure book. I very fondly remember one from when I was a kid, where you were hopping back and forth in time, hunting down dinosaurs, with the ultimate goal of finding an archopteryx. Well, that sort of adventure and excitement is coming to your tabletops in a new form from Z-Man Games. The first of these is called House of Danger. The classic Choose Your Own Adventure series comes to life in this new narrative adventure game. Will you survive the House of Danger? Pre-order from our website or your local retailer and solve the mystery! Images flash through your mind. You only catch a few visuals from these premonitions before they disappear. A grand staircase. A dollar bill. A looming statue. A chill runs up your spine. You know there is danger ahead, but you can’t resist the case. 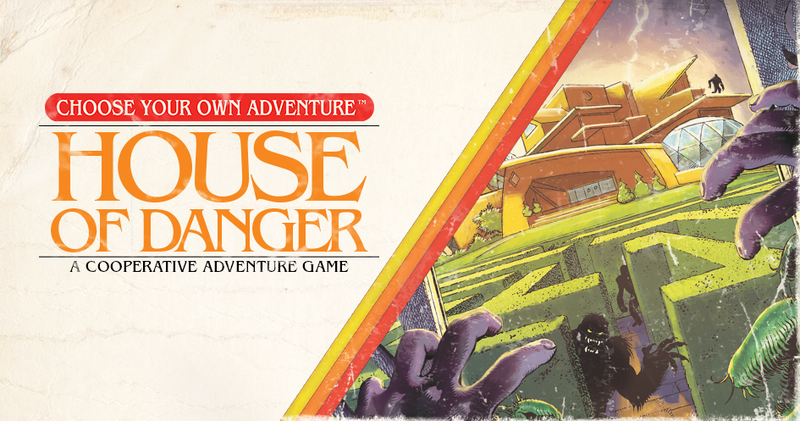 In Choose Your Own Adventure: House of Danger , you are a psychic detective, haunted by the mystery of the missing owner of the Marsden mansion. With only a water bottle, your trusty pocketknife, and confidence in your detective skills, you set out to solve the mystery.